We came together with a goal of enhancing lives. We are women, partners, stay at home moms, teachers, attorneys, real estate agents, creative directors, corporate recruiters and more. We are self-motivated, compassionate, energetic and driven to achieve a better quality of life. We work from the comfort of our homes on a flexible work schedule. We are marketing representatives for a billion dollar US based manufacturer of health and wellness consumer products. We invite people to take virtual tours of our company and store and educate them on the differences between our brand and the brands they currently shop with. Our goal is helping consumers achieve wellness and save money. We also act as their customer liaison through the process of opening their shopping account and test driving our brand. We are compensated for referrals but also earn residual income and bonuses as customers continue to shop. You want more! More income, more time, more	wellness, more happiness, more purpose. You want to feel valued by the company you work with while feeling part of a team. You are driven to make a difference. You want to partner with ethical, successful, wellness-minded individuals and entrepreneurs. We want to chat with you for a few minutes and tell you who we are, how we work together and how we can help you create an income working with us from home. Our heart is to help women provide for their families but be able to do it around their lives. Simply fill out this short questionnaire to be considered. Copyright 2017, Women Live Well. All Rights Reserved - Website Hosted by The Platinum Synergy Group Inc. I was a new Mom desperate to stay at home with my newborn daughter, but also knew we needed my full time corporate income coming into our household. There just had to be a legitimate opportunity that would allow me to have the flexibility I wanted and I knew my family deserved. While continuing to work as a creative director in the corporate Sector, I started working with Moms Live Well on a part-time basis around my family's needs. With the tools of this team and company I was able to replace my full-time income. Today I have three amazing kids and a husband I get to spend time with and enjoy. We are living life on our terms -- financially free and in control. I wake up each morning excited about helping others achieve their goals. I now have the opportunity to be a stay at home mom with the added bonus of providing a significant income into our household. We are so thankful to be partnered with a team and company with such phenomenal support and the tools to help you get started the right way! This truly is a team that cares about you and your success! 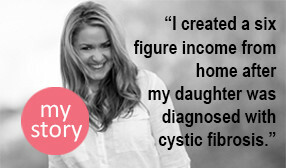 My first daughter, Ali, was born with Cystic Fibrosis. I was 25 years-old, working a corporate job as a recruiter which didn't allow me the option to work from home. I was desperate to find something I could do from home to be with her and tend to her care daily. Something that would also allow me to earn enough to give her the best care, the best choices, the best life she could possibly have, despite her diagnosis. After leaving my corporate job, doing a lot of research and holding on to hope, I finally found what I was looking for and partnered with a team driven to help others succeed on their own terms. Before starting on my own journey I had never tried a home business or a home job opportunity... but I had passion! I partnered with a team that empowered me to replace the income I left behind and three years later was able to retire my husband too. It’s been just over 14 years and we’ve been able to create a thriving, multi-million dollar business working from home while helping countless others create their own success stories. We offer you a lucrative, easy-to-follow, proven business model in the wellness industry. We show you how to increase your residual, recurring income in the best and most efficient way possible. Prior to finding our team I was a successfully dissatisfied direct sales professional approaching a decade with my company. I was also finishing a second graduate degree and at a crossroads about the direction I wanted to go professionally. I no longer wanted to work within a MLM model doing home party sales but all of my professional experience was working for myself from home. While sorting things out I was in a car accident and sustained a cervical spine injury. In an instant, everything changed and working any kind of structured job was no longer physically possible. Early in my recovery process I was introduced to our team, and I quickly realized the answer I had been searching for. I was able to begin building a business around my recovery, and my residual income put food on the table and kept the utilities on – even in months when I wasn't physically able to work. During this time I also got married, became a stepmom, and then gave birth to my son. 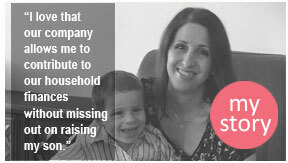 I've partnered with our team for five years now and am a work from home, stay at home mom to two-year-old Lorenzo. Our team has been the best use of professional time I've ever known! I am passionate about sharing these life changing products but also about helping others discover the tremendous opportunities that exist for them through partnering with our team!! The freedoms and choices that are available to me because of this company are unlike anything I have found elsewhere. I often describe it as being able to say yes every single time I want to instead of sometimes being forced to say no. I was working for a computer software company when I was first introduced to our team. My job required me to travel for weeks at a time and being away from my family weighed heavily on me. We were struggling financially and more than anything I wanted to be home full-time with my children. When I was pregnant with my second I knew I needed to make a change if I ever wanted to realize my dream of becoming a stay at home mom. I couldn't just quit my job because we relied on my income so I needed to find something I could do alongside my full-time schedule until I could fully replace my corporate income. I came across this team and it was everything I could have hoped for. It gave me flexibility to work around my corporate job while still having time for my family. It also came with all of the support and tools I needed to be successful. I had never worked from home before so the support from the team was invaluable. I was able to replace my full-time income and was able to leave my full-time job, and am now living my dream of raising my four children. This team and company have allowed me to be there for all the important events in my children's lives. I also get to be my own boss, volunteer at the kids schools and watch them participate in after school activities because I get to set my own hours around my family's needs. I have been with our team since December 2005. Like many people, I tried a few things prior to finding this team, and I lost thousands of dollars! But, I have a very entrepreneurial mind-set so it has always been a goal of mine to be successful while owning my own business. Unfortunately, I could never find anything that worked or was legitimate until a friend called and shared the exciting details about this team. Everything just made complete sense; I got started right away. At the time I was working 50-60 hours per week outside the home, and I was definitely ready for a change. Working this business on a part-time basis has allowed me to replace and then double my income! 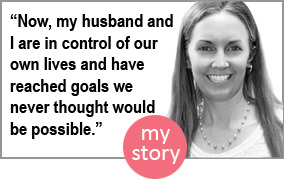 Now, my husband and I are in control of our own lives and have reached goals we never thought would be possible. We want to continue living the life we have and doing the things we enjoy -- like going to Disney yearly and spending time with our family. Being our own boss and having the flexibility and time freedom to continue to achieve our goals, while helping others do the same, is what this team can do for you! We are so thankful to be partnered with a team and company who cares about us as individuals and wants to see us succeed. They provide amazing tools and support so you can get started the right way. We have enjoyed helping many others reach their financial goals and we cannot wait to help you too! We are excited to provide you More Information on how to change your future. We are a group of individuals who are self-motivated, energetic, compassionate and driven to help others achieve a better quality of life. Where did you hear about Women Live Well?